Hitachi Vantara recently completed our acquisition of REAN Cloud, a global cloud systems integrator, managed services provider, and solutions developer of cloud-native applications. Through this move we, among other things, reinforce our ability to accelerate secure enterprise cloud adoption across multicloud environments. Soon you can expect another blog from me that looks more at this exciting move and what it means for Hitachi Vantara. However, before that I’d like to talk a bit more about multicloud in general and why it’s so vital. The reason can be summed up in two words, digital transformation. Let me explain. Today, multicloud, along with data analytics platforms, machine learning and AI, is one of the technology pillars supporting this era of digital transformation. These digital transformations are happening all around us right now, from the theme parks you visit with your family to the many retail stores you shopped in last holiday season. I think it’s safe to say that digital transformation is a key focus for businesses all over the world and will intensify in the year ahead with multicloud, which is an agile and responsive infrastructure, right at the center of it all. What’s interesting is this — while multicloud is so vital to these transformations, it often gets lost in the discussions that are taking place. But that may all be changing. According to a study from our friends at 451 Research, 69% of organizations plan to be running a multicloud environment by 2019. In this instance, they define multicloud as having two or more cloud services from two or more cloud providers. Based on these figures, it’s clear that multicloud is quickly becoming the new “black.” In order to glean some additional insights into the multicloud world, I spoke with Melanie Posey. Melanie is the research vice president and general manager for 451 Research’s Voice of the Enterprise: Cloud Transformation offering where her focus is on tracking, analyzing and anticipating the pace and nature of enterprise cloud adoption. I began by asking Melanie about trends in cloud transformation and her first answer was, you guessed it, multicloud. Melanie: At 451 we talk about this being a ‘multicloud world.’ But this multicloud world is not necessarily all about public clouds. It’s about on-premises clouds, private clouds hosted in co-location facilities, managed clouds and also many different public clouds. As a result of this, another major trend we are seeing is complexity. Ironically, public cloud and cloud in general have brought a lot of agility and flexibility into IT, but the price you have to pay for that is complexity. Because of that, enterprises that are moving towards digital transformation and business innovation are going to need to manage this complexity using things such as intelligent automation. Partnerships will play a big role in helping to herd all of the ‘cats of multicloud’ and having a well-behaved IT cat that is intelligent, automated and provides the flexible resources needed to succeed in the digital world. Bobby: When we think about multicloud, we often talk about it from the perspective of infrastructure. But arguably there is another topic that is not getting enough attention — the value this environment brings which is the ability to create the velocity in terms of DevOps and CI (Continuous integration) / CD (Continuous Delivery) automation because what we are ultimately trying to do is release applications and services at a much faster rate and create differentiation in the industry. 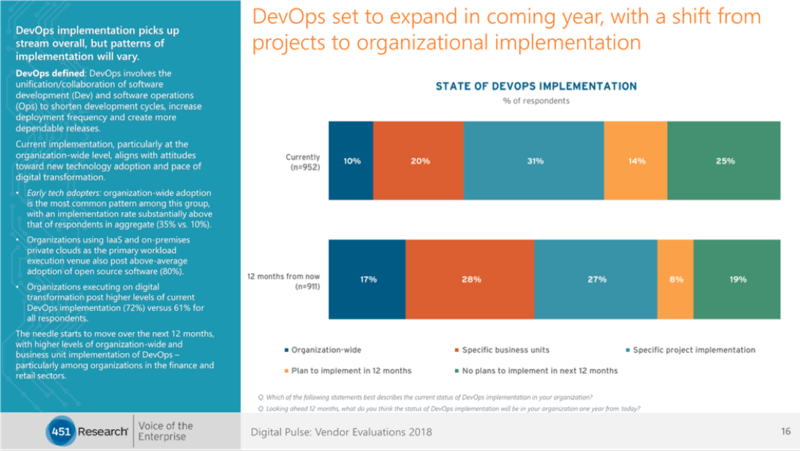 With that, do you see DevOps moving higher up in the priority list for enterprises today? Melanie: Absolutely. In one of our Voice of Enterprise Surveys, we found that there are only about 25% of organizations that have no DevOps capabilities within their organizations. What we are starting to see is a recognition that DevOps is a big part of the innovation engines and IT and DevOps are coming together in terms of coordinating and collaborating on a daily basis and understanding each other better. We used to have this situation where not only did IT Ops and DevOps live in different part of their organization, they were practically on different planes of existence. So, part of the transition happening now is that IT Ops and DevOps are often sitting right next to each other and having cross pollination in terms of which workloads and which applications should run in which IT environment. This brings us back to multicloud being the foundation of digital transformation and the IT Ops and DevOps people having a big say in IT from the perspective of what are the best execution venues for these workloads and apps that fuel business. As you can imagine, when it comes to cloud, the list of trends and storylines are infinite and in my next blog I will continue on the multicloud path, focusing on how it relates to REAN Cloud. It’s an exciting move for Hitachi Vantara and will help to drive some incredible developments it the year ahead. Do I have your interest? Stay tuned for more.